September's update brings you a previously unseen Buchschmid and Gretaux wood inlay piece titled Christ on the Cross. We have to admit that this is one B & G work we haven't seen before. 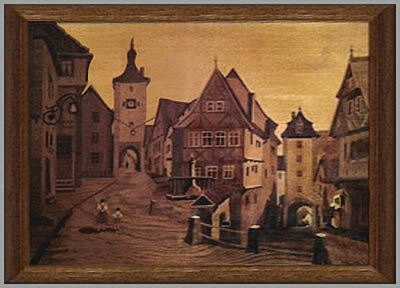 The Rothenberg picture is also a bit unusual in that it contains two children walking up the town street. Yet another variation we haven't seen before! 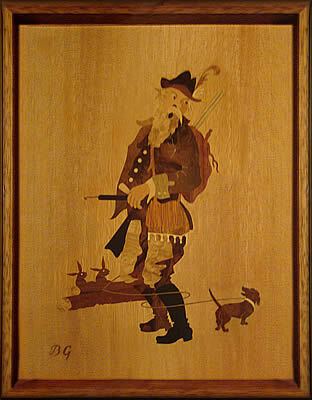 Our September update brings you a B & G wood inlay picture we have never seen before. 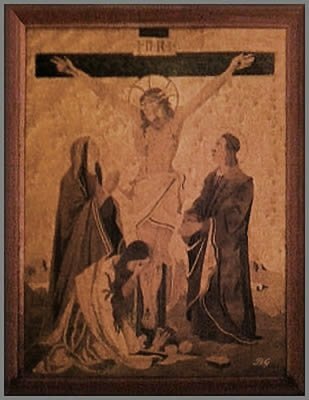 Christ on the Cross is a 'new' Buchschmid and Gretaux wood inlay picture to us. The closest reference we can find in the official Buchschmid and Gtretaux listing and catalogues is "The Lord" - but without the B & G label on the reverse of the piece to confirm any title we just have to be guided by our own assumptions. The owner of these pieces, Kathy Hardeman, tells us that there is no information of any sort on the back of the picture, but the BG logo is prominent in the lower right hand corner of the picture. The BG logo is a pretty good indication of authenticity, but the usual accompanying label does help quite significantly to confirm the piece's origins. Although we are not that aware of any Buchschmid and Gretaux forgeries turning up at auction so far, it is not inconceivable to assume that, due to the collectability of B & G pieces these days, there will probably be some movement in that area before too long. Don't forget that onlay a few years ago the B & G version of 'The Last Supper' sold in online auction for a four figure sum - and that level of monetary reward could easily attract interest in the forgery arena. The third picture in this September update shows you an interesting variation of the popular Buchschmid and Gretaux picture titled "Rothenburg Ob Der Tauber". This version of that picture shows two children in authentic costume ambling up the main street towards the clock tower. We have seen variations on this theme where two sightseer's are shown enjoying the view looking down into the quaint main old town. Click the above button to return to page 47 of "Can You Help"